People often ask: What’s the “best” or “most popular” type of paint to use? This is a question that virtually has no definitive answer. Not what you wanted to hear? Don’t worry; we’re here to give you some pointers! The fact is that the “best” paint to use depends on the skill and patience of the painter, and also the type of “look” desired. Different paints will give a different type of character to the subject of the painting, and evoke different types of emotions from an audience. For example, watercolor often lends to a more muted, somewhat clouded image. While colorful, it also has a more softened look. The subject can look runny or malleable. 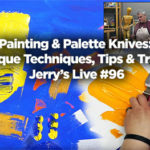 Oil paint is very rich and vibrant. Oil paintings usually have a sharper image, but it’s also good for colorful pieces that feature a layering of paint. Acrylic is generally always going to give you something in between. 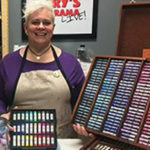 Depending on the technique used by the artist, artist acrylic paints can look very much like oil or watercolor, and the meshing of the two lends to a style that is uniquely its own. These are generalities; of course, the result depends on the technique and style of the artist. 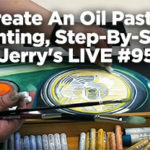 Aside from the more abstract features of the products, there are fundamental differences between watercolor, oil, and acrylic paint that should be taken into consideration before choosing which medium is best for you. Pros: Generally the least expensive of the three paints, watercolor makes it easier to paint large areas, or spaces that do not need to be completely filled in (like a painted face on a white background). A small tube of watercolor, mixed with water, can provide yards and yards of coverage. Watercolor offers nice color saturation, and dries pretty quickly. Cons: While the techniques for using watercolor are fairly simple in theory, they are difficult to master. It takes a special talent and lots of practice. It is more difficult to cover a mistake. It is also a more fragile method in two ways: the paper surface and the fact that one drop of water can ruin details which took hours to create. Notable Watercolor Artists: Winslow Homer, J.M.W. Turner, and John Singer Sargent. Pros: Oil paints are associated with permanence. They are best to use for demonstrating great detail and the contrast between light and dark. Light refracts through layers of oil paint, creating a luminous appearance of depth. Oil paints are durable and will stay solid over time — many famous masterpieces dating from the Renaissance onward are painted in oils. Cons: Oil takes a very long time to dry — between 6 months to a whole year. This increases your chances of making a mess or a foreign object (dust, bugs, etc.) getting stuck in the paint. It is the most expensive on the market, and, well, it’s also pretty permanent. Oil must be removed from brushes with turpentine, and it is very easy to stain your clothing and other surfaces. Additionally, most oil paint thinners and turpentines are toxic and not particularly safe for prolonged contact. Notable Oil Artists: Vincent Van Gogh, Pablo Picasso, and Claude Monet. Pros: Acrylic is the happy hybrid of the bunch. Like oil, it is well-suited for detail, but it is also easy to use. Artists have classified it as the most “forgiving” of the paints and best for novices. Acrylics are also water-based which means they can be cleaned from brushes more easily. Cons: On the other hand, acrylics can contain various toxins within their pigments. 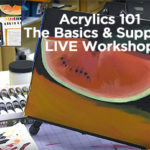 Acrylic paint dries very quickly and is not easily blended. We’re also not quite sure how long they will last. Unlike the other paints, they have only existed for about 50 years. Notable Acrylic Artists: Andy Warhol, Mark Rothko, and Roy Lichtenstein. If you are still undecided about which paint is right for you, you can better familiarize yourself with the artists and paintings from each category. 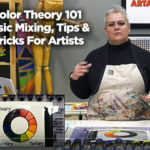 This may give you some insight on which paint is best for your style and subject. If research fails, you can always just get right to it: Pick up a brush and experiment!